Songbirds wintering in Mexico and Central America time migration by the length of the day. Longer days trigger hormones that key flight north. Unfortunately, length of day sometimes has nothing to do with our weather, like now. The birds arrive expecting to find trees and shrubs leafing out, and the usual worms and insects on those leaves. These two events — migration timing and spring growth timing — have been a vital pairing for uncountable years. When we get a prolonged cold spring, early migrants have trouble finding food. 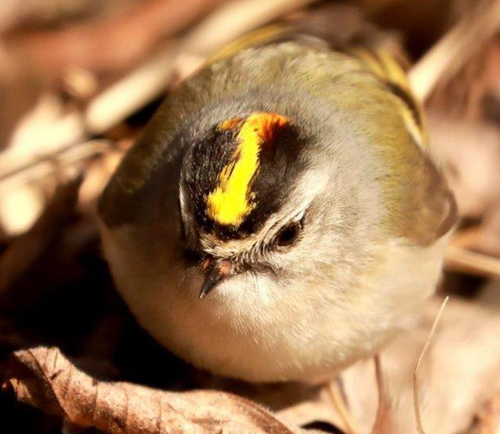 This Golden-crowned Kinglet was photographed April 1 by Harris Mallory. He found the bird at the Old Cedar Avenue bridge in Bloomington. Look closely and you will see that the bird is foraging on the ground, in dead leaves. 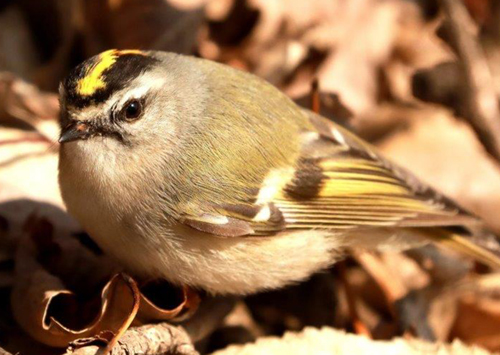 Kinglets should be flitting from branch to branch, tree to tree gleaning freshly hatched insects and worms. These birds have more than a week to go before those anticipated events even begin. Kirtland's Warbler: could this rare bird be nesting here?